BetterPoints Ltd – Barclays Entrepreneur Awards 2017: we didn’t win, but we got to the final! Barclays Entrepreneur Awards 2017: we didn’t win, but we got to the final! We are delighted to have made it through to the final of the Barclays Entrepreneur Awards 2017, which were presented at a ceremony in London last night. 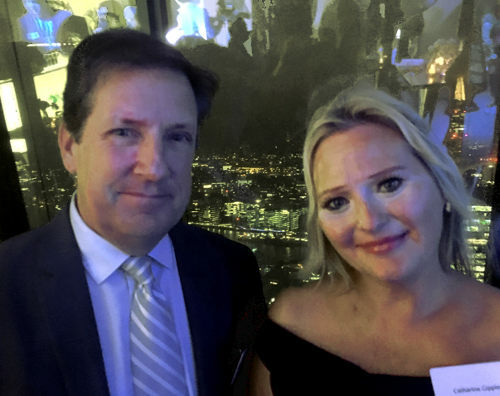 Our CEO, Daniel Gipple (pictured with his wife, Catharine), was at the ceremony, which was opened by Barclays CEO, Ashok Vaswani. Baroness Karen Brady CBE, best known by many as aide to Alan Sugar on The Apprentice, presented the awards. BetterPoints was through to the final for ‘Social Venture Entrepreneur of the Year Award’, having won in the South East Region earlier in the year. We didn’t win, but we were competing against six other worthy finalists and are very proud to have made it that far. The award went to Goodwill Solutions. Next: Next post: BikeSmart Reading wins another award!